Wisconsin Governor and presidentially-obsessed Scott Walker's is signaling that the state's 2017-'19 biennial budget in preparation will likely greatly restrict borrowing across-the-board, though more new highway building is still planned in SE Wisconsin to keep Walker's-well-heeled-friends-the-road-builders happy. The strategy is foolish because exceptionally-low lending rates make strategic borrowings smart and cost-effective, and because from nationally-ranked potholes to UW system buildings in disrepair, the state has basic infrastructure deficits that everyone knows need fixing and upgrading. Despite the obvious, Walker has said he will not add even a penny to the gas tax or a buck on any vehicle fee - - your Grover Norquist-101-starve-and-shrink-government mantra at work- - and 'Wisconsin is the model' - - because Walker wants to present a GOP-pure, no-tax-increase image no matter how short-sighted - - to any prospective GOP voter or donor. Which means Wisconsin priorities are going to take the same back seat to Walker's national ambitions and presidential obsession that led him to kill the proposed Kenosha casino in 2015 because Iowa GOP bigwigs let him know that anti-gambling Iowans would oppose him when the caucuses rolled around if he approved that expansion of gambling. By the same token, look for Walker to make sure his "chamber of commerce mentality" Wisconsin DNR approves a 26,000 hog feeding operation proposed for pristine NW Wisconsin by a leading Iowa pork producer. Remember when New Jersey Governor and Walker-best-friend-once-upon-a-time Chris Christie pandered before the caucuses to Iowa hog producers? 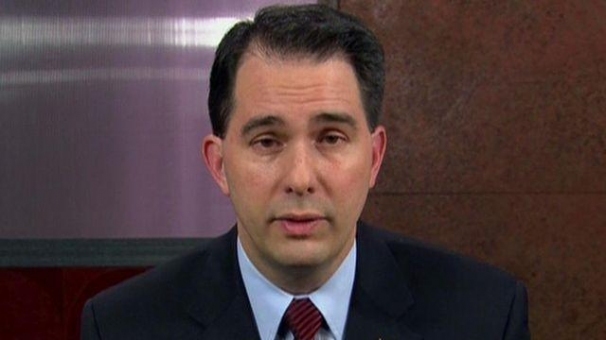 An equally unprincipled Walker has and will likewise put his ambition ahead of his homestate's needs. His only interest in nuts and bolts' state governing is getting them attached to his next campaign. He will need more to run on than than "a wife, two kids and a Harley" and building TWO border walls to protect us from Mexico and Canada, so some major divide-and-conquer is on the way. Attacking public workers as terrorists and then private unions is going to be old news by the time 2020 rolls around. I have been reading stories about this "26,000 hog feeding operation proposed for pristine NW Wisconsin by a leading Iowa pork producer." Why doesn't he create his 26,000 hog feeding operation in Iowa? Why is he going to Northern Wisconsin to set it up? Don't they have enough land and water in Iowa? Too many hog CAFOs in Iowa, leading to spread of a virus. So they are outsourcing all that to N. WI! This guy is a really hard weed to eradicate. Has anyone else noticed that Trump spokesperson Katrina Pierson has the same mishapped face with misaligned eyes as Scott Walker? What is it about these teabaggin' folk anyhow? I'd like to see the Governor's office and mansion turned into manure lagoons. Unfortunately, they do not have enough capacity for the feces and urine of even one of these concentrated animal feeding operations, but it would still be a good start. that's a good one.....borrowing money is smart and cost-effective because rates are low....LOL.